On my whirlwind trip to my class reunion in Mississippi, I was able to spend a few hours at my parent’s house for a remote chickendiary. 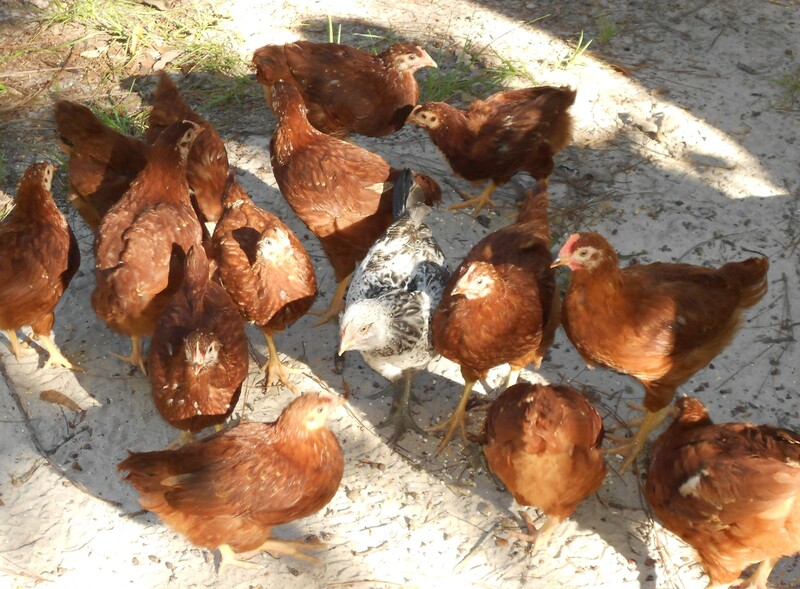 My dad has over 30 Rhode Island Reds, and his chicken operation is big enough to sell eggs to family and friends. I was able to get away with a half-dozen, but I had to trade two Violet’s and four Rosie’s to get them. Bill does know the value of a dollar! 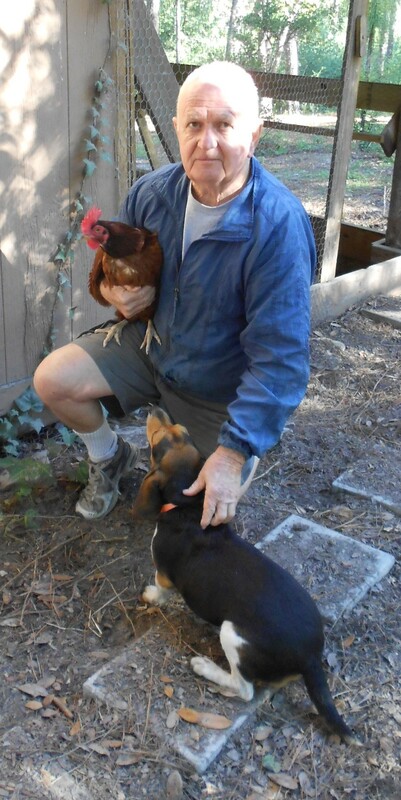 He’s not used to catching his chickens and/or holding them but he did manage to grab a cute little victim for a photo-op. OK, my camera was doing something freaky, but I really like this effect! Disco Chicken! 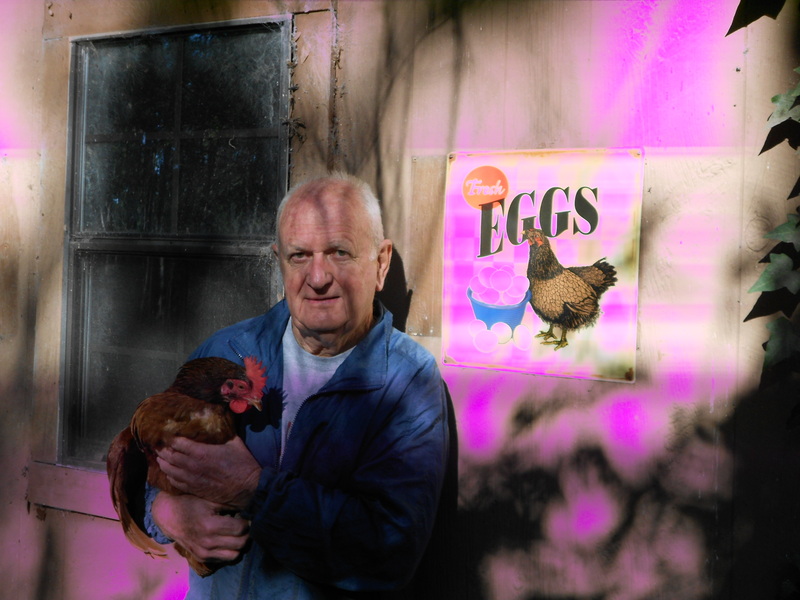 Dad has two generations of chickens. The first batch is a couple of years old. Rhode Islands are great layers and they each average 6 eggs per week. The newest ones are around 2 months old and are not laying yet. 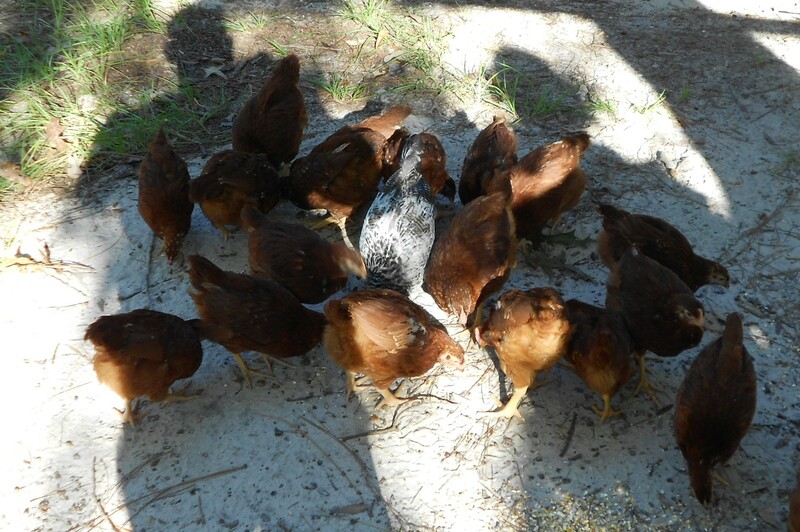 After he got his babies, he noticed that one chick was distinctly different. As the chicks grew, Daddy realized that somehow a different breed had gotten mixed in with the RIRs. This little girl looked vaguely like an owl, so he named her “Hoot”. (his other chickens do not have names). 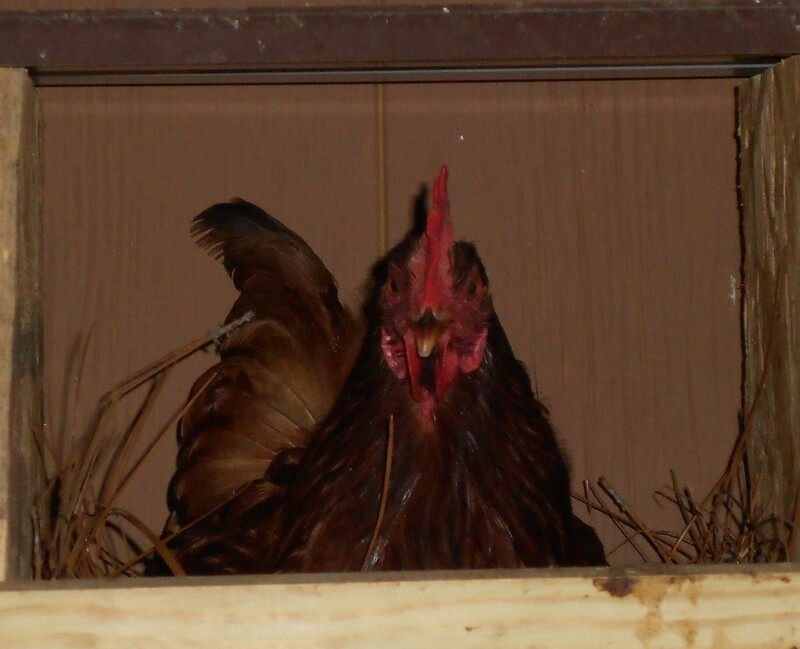 Hoot gets along fine with her sisters but it’s obvious that she is NOT a Rhode Island Red. We got on my parent’s computer (after we wiped off the dust and cobwebs) and fired up the internet to find out what breed she was. Turns out that Hoot is related to Rosie! She’s an Ameraucana, but her coloring is different. There are several colors for this breed. 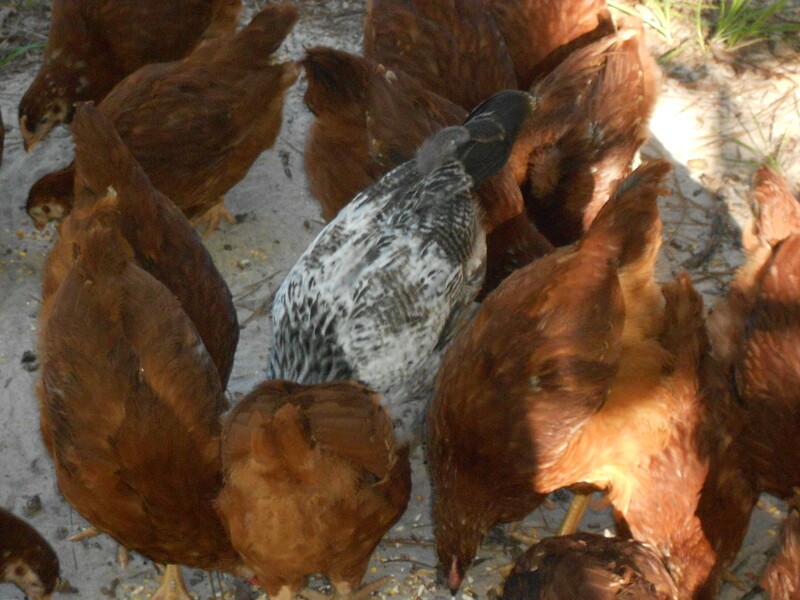 Rosie’s is the most common, but “Silver” is recognized by the APA (American Poultry Association). 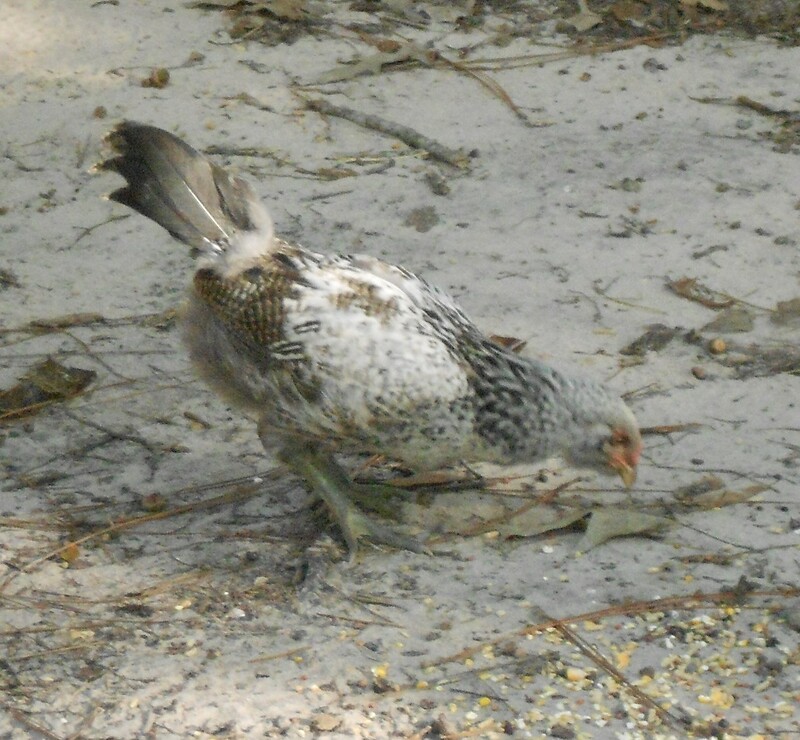 It was hard to get a good photo of Hoot among the sandy ground and dappled shade of my parent’s barnyard. She is almost camouflaged in the environment. Where is Hoot? Oh, there she is! She’s just getting her beard and she has the same green feet as Rosie. Here are some shots of her mingling with her sisters. …and even a couple of rockers. Dad says they’re fine to sit on if the chicken s**t is dry. 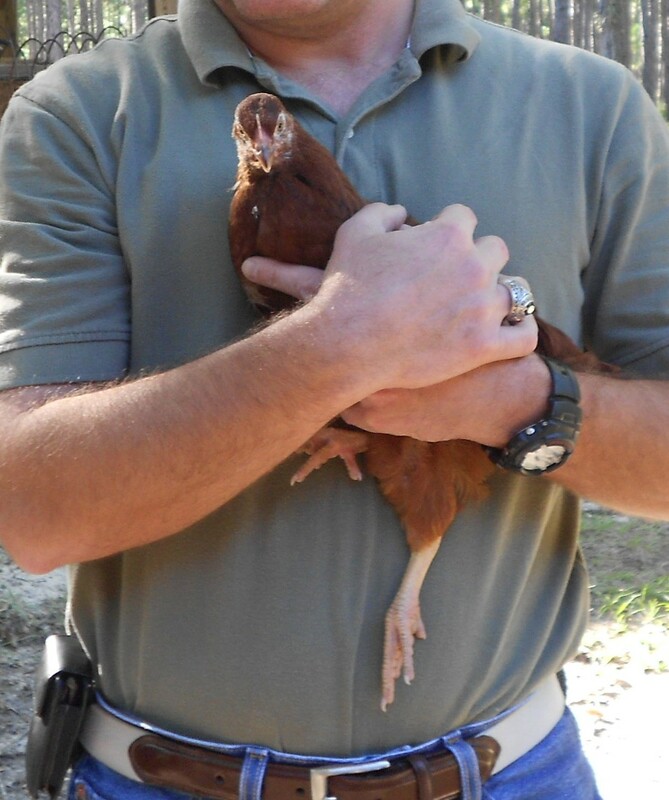 Jim added Rhode Island Red to his “chicken holding” resume. Hey this guy seems pretty experienced! In addition to his egg operation, my dad also has a pine straw bale business. He rakes straw on his 200+ acre property, hauls it, bales it and ties it all from his state of the art (riiiiiight!) facility on Talowah Road. 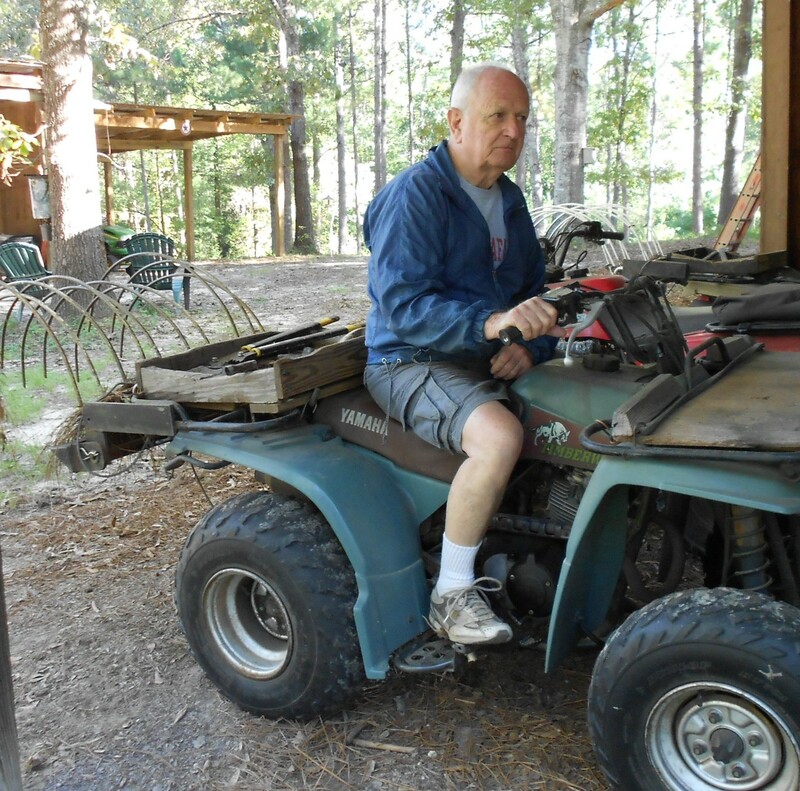 Just one of his four-wheeler fleet equipped with a rake attachment. Great action shot Dad! He named it “Talowah Road Pine Bales” but I said it should be called “Bill’s Bales”. I’m just sayin’. 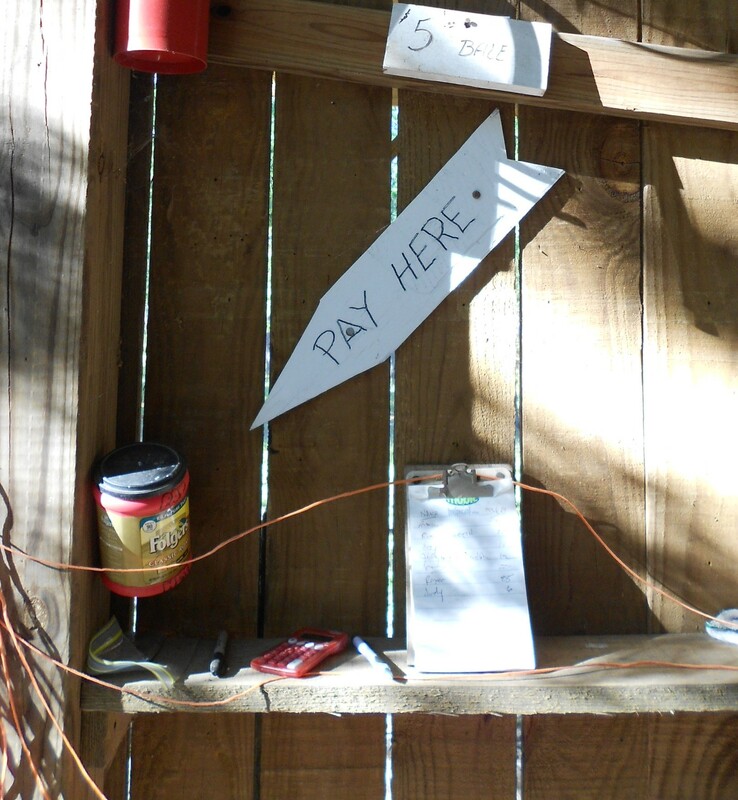 Anyway, sometimes folks come to get a few bales of straw, and if Daddy isn’t there, they can take their bales and pay with the state of the art honor system he has installed inside his barn. Payment system developed by IBM. 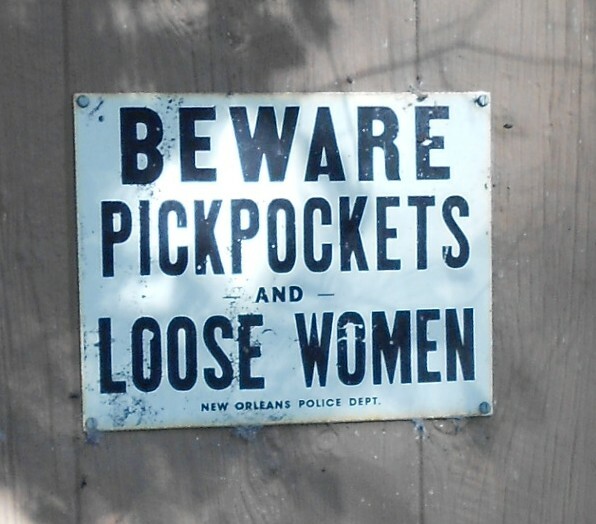 …and undesirables are discouraged from loitering. 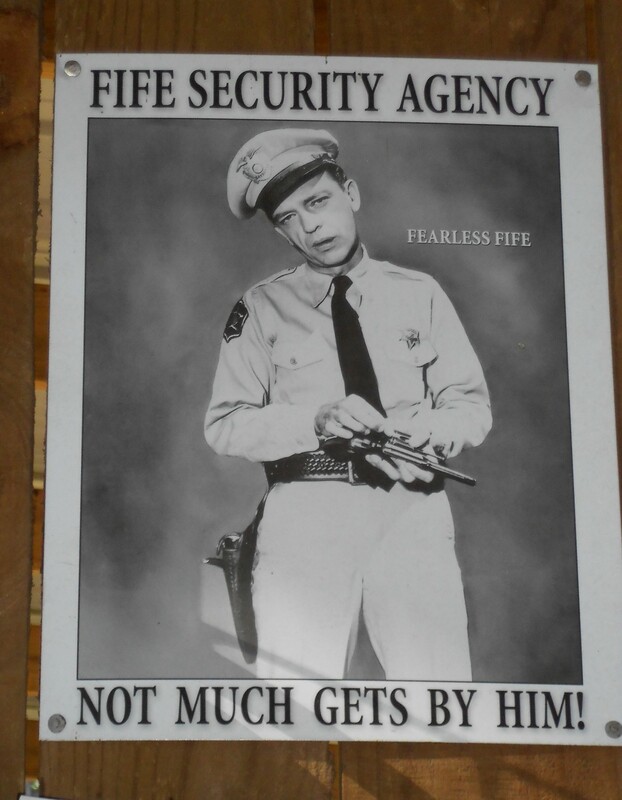 My dad’s other job is security guard for a mental hospital housing those who have run afoul of the law. Did I mention that Daddy is 77 ? His first career was Navy pilot during the Viet Nam war. 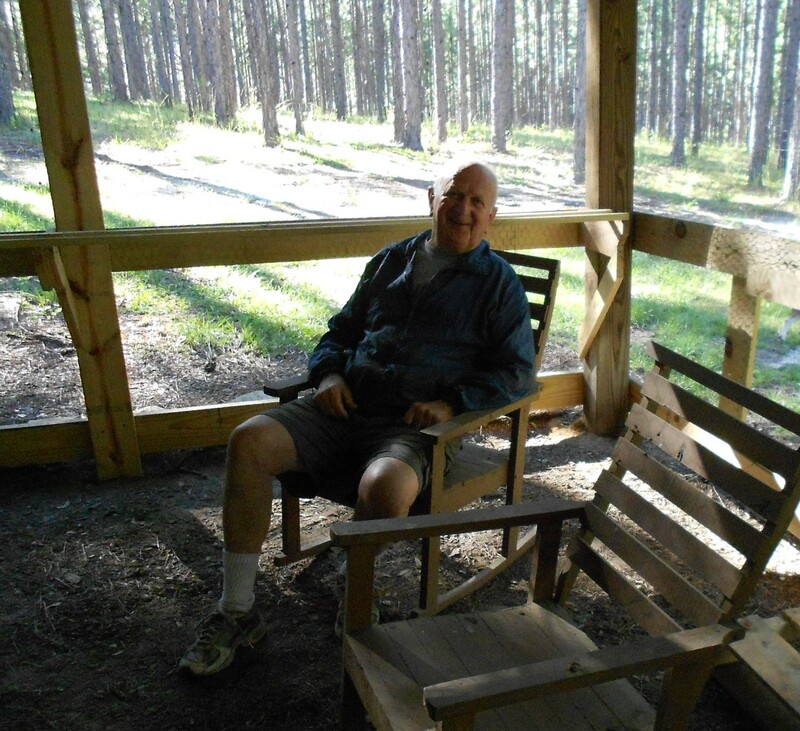 He retired from the Navy, then flew a rescue helicopter for a regional hospital for another 20 years. He’s also run a few marathons, been a lifeguard and worked in a toaster factory. In his free time he teaches CPR. So even though I’ve poked a little fun at the guy, you can see that my dad is a pretty cool dude. I kinda like him. OK, I guess I love him. Sorry about the mushy stuff Dad! I owe that man a lot of quarters! Glad you are fixing your reception to all things CHICKENDIARY!!! Your life will improve immediately. Thanks, cousin! I’ll swear I was always so jealous of you growing up!! Your house was victorian, the yard always gorgeous, the food hot & yummy & your Dad was definitely a cool character plus man of mystery! 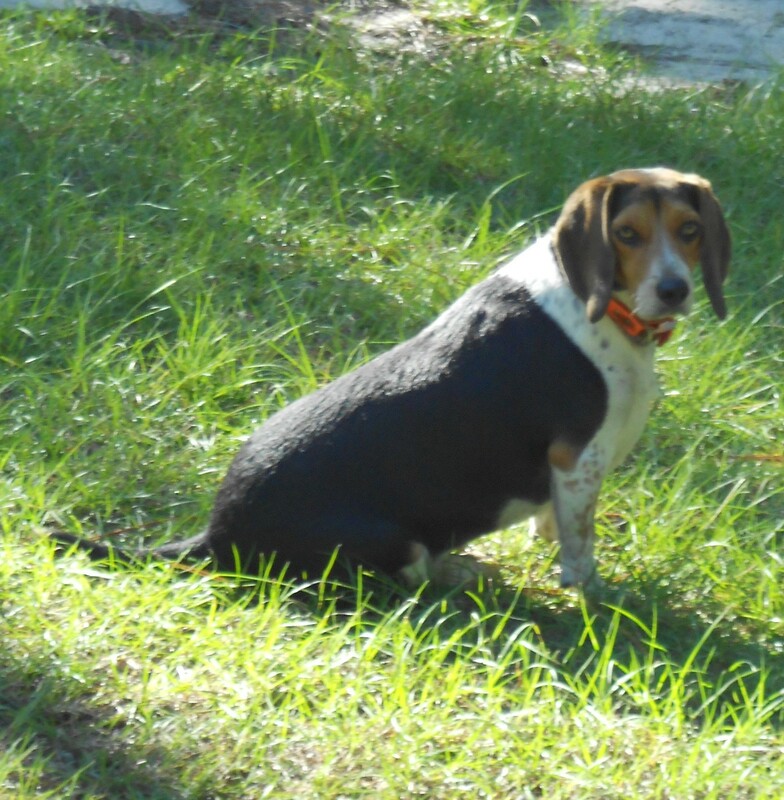 I’m gonna just have to go see Mrs Peggy & Mr Bill very soon!!! Thanks so much for this post. The Pegster and Billinator would absolutely love a visit from you! Call ahead and request cream puffs!